It is with deep sadness that ecancer.org records the death of our esteemed co-founder Professor Umberto Veronesi, the world famous cancer surgeon. Professor Veronesi’s extraordinary contribution to the current cancer care is beyond compare. Throughout his career Veronesi’s mantra has been to define the minimal effective treatment which improves the quality of life of patients, with his ground breaking studies leading to a world-wide acceptance of conservative surgery in all forms of cancer. Over his 60-plus year career he was the first to dare trial the conservative management of breast cancer instead of mutilating mastectomy. He was widely criticised by surgical colleagues and accused of unethical treatments. Thanks to his courage and subsequent confirmation of his trial results, millions of women have been cured without losing a breast. He also pioneered the sentinel node biopsy procedure to avoid lymph node dissection, and intraoperative radiotherapy in breast cancer. Veronesi also fostered the concepts of adjuvant chemotherapy and chemoprevention, continually striving not to take anything for granted and driven by curiosity to find better ways of doing things. He is widely acknowledged by his peers as a visionary who led a humanitarian crusade to improve the lot of mankind and maintain the dignity of cancer sufferers. In this quest he initiated the Science for Peace, and the Future of Science global conventions, founded the European Institute of Oncology (IEO), the European School of Oncology, the Umberto Veronesi Foundation, EUSOMA and Europa Donna. He authored more than 790 papers on Clinical and Experimental Oncology and 12 oncological treatises. 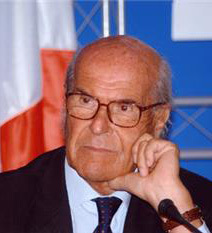 Between April 2000 and June 2001 Veronesi was Minister of Health in the Italian government and was Senator of the sixteenth Italian Parliament from April 2008 to February 2011. Further to his belief that knowledge should be free, in 2007 Professor Veronesi co-founded ecancer.org, with Professor Gordon McVie. ecancer.org a pioneering online open access journal and medical education platform. The goal of the organisation both then and now is to speed up free cancer communication globally and improve patient care via better professional education. ecancer.org continues to be an embodiment of Veronesi’s vision of an independent cancer journal which is free to read and is mainly funded by charitable grants and sponsorship. During his career he also served as the head of organizations including the International Society of Cancer Chemoprevention, the International Union Against Cancer, the Committee of Cancer Experts of the European Union, the Federation of European Cancer Societies (FECS) and was EORTC President from 1985 to 1988. With his death the world has lost a true visionary. He will be sorely missed by everyone who had the privilege to know and work with him over the years. His last exhortation to us was to "carry on our work because the whole world needs science and reason."